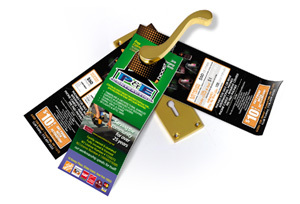 Our Jumbo Postcards and Postcard Mailers are perfect for creating a big impact in the mailbox. 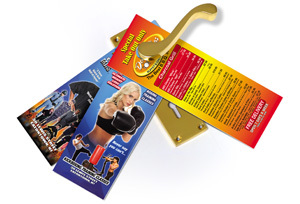 Spread your message quickly about a party, sale, or grand opening in a JUMBO way! • 14 or 16-POINTS THICK - same price! • FREE PRINTING on the second side of your jumbo postcard as an added bonus! 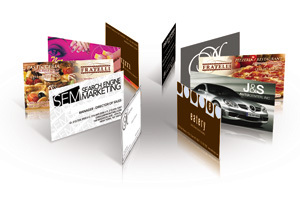 Create a Jumbo Postcard with a powerful statement quickly and inexpensively! Announce Grand Opening - you only get to have one grand opening, so you might as well get the word out to as many people as you can. 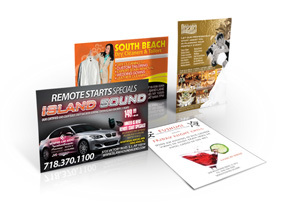 Jumbo postcards can include all of the business information as well as offering information about the new business and the types of products or services being offered. You can mail them yourself, drop them off door to door, or use our EDDM service to have them delivered for you. Announce a Sale or Offer a Coupon - if you have a big sale or discount offer coming up soon, make your customers aware of it by having a large stack of jumbo postcards by the counter with all of the information. If the cashier does not see them take one, instruct them to put one into their bag upon checking out to make sure they see it at home. Flash Cards - if you have children, you know how hard it can be to keep them focused at times. Create your own educational flash cards to keep them focused and on point. When making your own cards, you can concentrate on the topics specifically suited to your own kids versus buying generic cards at the store that may or may not have the topics you need. Custom Christmas Cards - if you want a custom holiday card but do not want to spend a lot of money, a jumbo postcard is the perfect substitution. You can create a unique card that will have friends and family thinking you spent a small fortune on personalized cards this year. If you need help ordering or designing your jumbo postcards, please call us at 888-888-0649 or click here to use our online support contact form.